Welcome to the Hudson Youth Soccer Association! HYSA appreciates your time, effort and dedication to the youth of Hudson and we thank you for volunteering to coach for HYSA! Coaching at the Small Fry and Advanced Small Fry level is one of the most important levels from a coaching perspective. This is where the players are first introduced to the game of soccer. 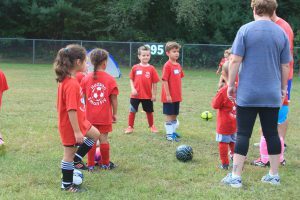 The coaching at this age is very important because it is important that they learn all the proper skills correctly, but it is more important that they have fun doing it so they will want to continue playing. This is a central location for all Small Fry and Advanced Small Fry related Documents, links and information. If there is something that is missing on this page, please send an email to the Small Fry Coordinator. For Small Fry, we play 8 weeks with one session per week. The sessions are always on Saturday’s from 9:00am – 10:00am at Lower Sauta Field at 530 Main St, Hudson, MA 01749. Every session consists of 30 minutes of fun drills and 30 minutes of an informal 3 v 3 scrimmage. Sometime before the season starts you will be contacted by the small coordinator with information for the upcoming season. Once the coordinator gives you access to our online registration system you will then be able to view your team roster. It is important to contact all parents as soon as the coordinator gives the ok. Please always make the first contact by phone so you can verify the player’s information. Please make sure the phone numbers, email address and spelling of the players name is all correct. Please instruct all parents to arrive at least 15 minutes early for each session and make sure their players are dressed weather appropriate and that they have water and their own size 3 ball. All the players are required to wear shin pads. Wearing cleats are not required, but are recommended. After you make the first contact by phone, you can send and email all the important info about the upcoming season. You can download the parent’s information letter below and modify it with the specific information of the season you are coaching. Please refer to the Small Fry & Advanced Small Fry Coaches Manual and the 8 week Small Fry Practice Plan practice plan. There are many fun games and drills in the manual. The object is to make it fun for the kids and maximize touches on the ball. The best games and drills are those that allow the most players active in the game and those that allow the players to touch the ball for the majority of the game. We try to stay away from the 3 L’s: Lines, Laps and Lectures. Please allow for plenty of water breaks. We do NOT use Goal Keepers at this age! The goals are very small and we want to encourage all kids and we want to all players to have a chance to score. Please do not allow players to stand in the goal. If a player naturally tries to stop an opposing player from scoring that is great, but we don’t want player to stand in the goal the entire game as a keeper would. We really want to stress that all coaches should be controlling the scrimmages. Remember our goal at this age is always FUN first! Want them to have fun, get interested in the game and create an environment that they want to return to each season. Then gradually and discretely we will teach and develop them into great soccer players. For the most part it has been our observation that a majority of the players prefer the practice sessions over the scrimmages. We believe this is due to the fact that the practices are all fun games and there is not that much competition as there is in the scrimmage. We also think it has something to do with the fact that some kids are more aggressive than others and some kids are bigger than others. We would like to ask all coaches to please try and even out the teams. When you split up your team to scrimmage on both fields please make sure they are as even as possible. During the scrimmages please make sure you control the more aggressive kids. We don’t want to teach them to not be aggressive, but we want to make sure no one gets hurt. We have had problems in the past with some kids pushing and knocking other kids over. We want to make sure they play the ball and if some players are too aggressive all coaches should step in and address the situation. If some stronger players seem to control the entire game and seem to do all the scoring, teach them to pass before shooting. We do not keep score! We also want to encourage all players. Not just the ones on our team. You should always make it a point to cheer on all the players during the scrimmage both on your team and the opposing team. For Advanced Small Fry, we play 8 weeks with one session per week. The sessions are always on Saturday’s from 9:00am – 10:30 AM at Lower Sauta Field at 530 Main St, Hudson, MA 01749. Every session consists of 1 hour of fun games/drills and 30 minutes of an informal 3 v 3 – 6v6 scrimmage. Sometime before the season starts you will be contacted by the Advanced Small Fry coordinator with information for the upcoming season. Once the coordinator gives you access to our online registration system you will then be able to view your team roster. It is important to contact all parents as soon as the coordinator gives the ok. Please always make the first contact by phone so you can verify the player’s information. Please make sure the phone numbers, email address and spelling of the players name is all correct. Please instruct all parents to arrive at least 15 minutes early for each session and make sure their players are dressed weather appropriate and that they have water and their own size 3 ball. All the players are required to wear shin pads. Wearing cleats are not required, but are recommended. After you make the first contact by phone, you can send and email all the important info about the upcoming season. You can download the parent’s information letter below and modify it with the specific information of the season you are coaching. Please refer to the Small Fry & Advanced Small Fry Coaches Manual and the 8 week Advanced Small Fry Practice Plan. There are many fun games and drills in the manual. The object is to make it fun for the kids and maximize touches on the ball. The best games and drills are those that allow the most players active in the game and those that allow the players to touch the ball for the majority of the game. We try to stay away from the 3 L’s: Lines, Laps and Lectures. Coaches are always on the field helping. Every week, you will split your players into two random teams each week to play two 3v3 games with coaches on the field. We start using goalies at this age and we will give you a pair of goalie gloves. We try teaching some basics – the words defense/offense are taught, throw-ins, goal kicks and corner kicks. Below is a list of all HYSA Small Fry/Advanced Small Fry related documents. Revolution Academy Curriculum Revolution Academy Curriculum for Small Fry and Advanced Small Fry (Password Protected) Note: Please contact your age coordinator for the password.